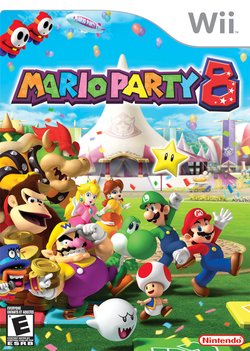 Mario Party 8 is the eighth installment of the Mario Party series on a home console, the first Mario Party game for the Wii, and the tenth game overall in the series. It is also the last Mario Party home console game to be developed by Hudson Soft before Nd Cube received control of the series. Mario Party 8 is notable for its strong use of the Wii Remote and its motion control capabilities in minigames. Players are required to perform various gestures in lieu of traditional button/joystick controls. Common motions include pointing-and-shooting, shaking, waving, turning, and twisting the Wii Remote. Player-created Miis are featured in this game, wherein they often show up within crowds. Miis can appear in certain minigames, such as Sugar Rush, and may also serve as the player's character in Extra Mode. By playing regular party games (via the Party Tent), minigames, and completing the Star Battle Arena mode, players will earn Carnival Cards, which may be spent to unlock figures and game features. Mario Party 8 features six boards, five of which are available from the start of a new save file. Although one board features the classic formula for obtaining a star (via reaching a changing star space and paying 20 coins), the other five boards employ unique conditions for collecting stars. Replacing the Orbs/Capsules from previous Mario Party titles is a similar item called Candy. Players can collect and use Candy, but are unable to place it on the board as traps. In Mario Party 8, the exuberant ringmaster MC Ballyhoo and his talking hat Big Top have invited Mario and the rest of the crew to the Star Carnival. Ballyhoo holds a special event, the Star Battle Arena, in which a contestant must win five successive party duels across the five standard boards. The winner will be crowned the carnival's Superstar and receive a year's supply of candy. Once the player has claimed victory in all five duels, Ballyhoo holds an award ceremony to present a special reward. In addition to the year's supply of candy, the player is promised the magical Star Rod. Before the player may receive their reward, however, Bowser swoops in and steals the Star Rod, only to retreat back to his special board, Bowser's Warped Orbit. The player and Ballyhoo then follow Bowser for one final duel. After the player triumphs over Bowser's chosen minion (either Hammer Bro or Blooper), Bowser begrudgingly returns the Star Rod. Yet, mere seconds later, Bowser changes his mind and challenges the player to a final showdown for the Star Rod. Using the Star Rod's magical powers, the player defeats Bowser, and returns to the carnival with Ballyhoo. At long last, the player is declared the superstar, and the credits roll. Just as with previous Mario Party titles, Mario Party 8 combines the social, strategic gameplay of traditional board games with quick, action-oriented minigames. In order to win a party, a player must obtain the most stars by the end of the last turn. Additionally, players collect & win coins in order to trade for Stars, buy Candy, and use special events on the board. Each board has a unique way of obtaining stars - most require finding a unique star-space and trading a certain number of coins for a star. Before the game starts, Ballyhoo introduces the board, and each player rolls a die to determine the order of play. On every turn, each player rolls a 1 to 10 dice to move along the game board. Prior to rolling, players may use Candy (if they possess any) and study the game board. At the end of a turn, all players enter into a randomly-chosen minigame to compete for a coin prize. Typically, the prize is 10 coins, given in whole to every player who wins the minigame. There are a variety of Minigame arrangements: 4-player free-for-all, 1-vs-3, and 2-vs-2. There is a small chance that a Battle Minigame will be played instead of a regular minigame. The color of the space that each player is on at the end of the turn sometimes determines what kind of minigame arrangement will be used (i.e. if two players are on red spaces and the other two players are on blue spaces, the minigame arrangement will most likely be 2-vs-2). Once the minigame is finished, and the coin prize(s) have been awarded, the turn is finished. After the last turn, three random Bonus Stars are awarded (if enabled during the game setup). At this point, the player will the most stars (coin count breaks ties) is declared the Superstar, and wins the game. Akin to similar mechanics in previous Mario Party titles, Mario Party 8 features an event called Chump Charity once the last five turns are reached. Ballyhoo reviews the player rankings and offers the player in last place either a free Duelo Candy or a coin prize. Before gameplay resumes, coin bag pickups are placed on every red space and single-coin pickups are placed on every other space. These pickups may only be collected once (by the first player who reaches the space they reside upon). If two players land on the same space or cross paths, they will only duel if one player is under the effect of Duelo Candy. If a player encounters another while under the effects of Duelo Candy, or lands on a VS space (Star Battle Arena mode only), they will duel in a 1-on-1 Minigame. The winner throws a dart on a spinning wheel to determine what prize they will collect from the loser. Most often, the possible rewards consist of: 1 coin, 5 coins, or 10 coins. Just like with previous Mario Party games, Bonus Stars are awarded at the end of game (if enabled during game setup). Only three of these randomly-selected stars are handed out per game. Minigame Star: Awarded to the player who won the most coins in minigames. Typically, this qualifies as the player who won the most minigames. Candy Star: Awarded to the player who used the most Candy. Both using Candy and purchasing Candy counts towards this bonus. Green Star: Awarded to the player who landed on the most green spaces. Happening ? spaces are the only green spaces in the game, and thus the only spaces that count towards this bonus. Running Star: Awarded to the player who traveled the most spaces. Teleportation mechanics and other means of movement besides a player's dice roll do not count towards this bonus. Shopping Star: Awarded to the player who spent the most coins in the Candy Shops. Simply visiting a Candy Shop without purchasing anything does not count towards this bonus. Red Star: The player who landed on the most red spaces earns this star. Landing on Bowser spaces does not count towards this bonus. The Mario Party 8 character selection screenshot after the hidden characters (Blooper and Hammer Bro) are unlocked. Mario Party 8 has a total of 15 playable characters (14 on the main roster). All 12 characters from Mario Party 7 return, and three new characters (Blooper, Hammer Bro, and Mii) have been added. Mii characters can only be used in the Extras Zone. It is notable that the new unlockable characters both make multiple appearances in previous Mario Party installments. 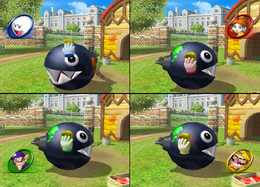 Blooper has appeared in various minigames along with Hammer Bro, who also appears as an Orb and a Capsule in Mario Party 7 and Mario Party 5. To unlock Blooper and Hammer Bro, the player must complete Star Battle Arena twice. The first completion will randomly unlock either Blooper or Hammer Bro, after defeating them in the final (6th) duel. To unlock the other character, the player must then complete Star Battle Arena once more, using whichever character was unlocked during their first playthrough. Mario Mario Bros. Power Players Fan Favorites Big Sarrios Flower Players 'Stache Clashers Fungi Fun Guys Soul Bros. Marionettes Super Snozzios BBQ Ribs 'Stache Splashers Heavy-Blow Bros.
Luigi Mario Bros. Waltzing Brawlers Green Machine Green 'n' Greedy Tango Tanglers Lean 'n' Mean Savage Sidekicks Scaredy Pants Cha-Cha Chasers Samba Smashers Cry Bones Blooper Scoopers Longtime-Foe Bros.
Blooper 'Stache Splashers Blooper Scoopers Royal Flush Double Dippers Drenched Stench Bloopsie-Daisy Bloop 'n' Snoop Spray Players Creature Feature Bloop-dee-doo What-the-Bloop Two-Toned Duo Blooper Bros.
Hammer Bro Heavy-Blow Bros. Longtime-Foe Bros. Glamour Hammer Hungry Hammers Scammer Hammer Barn-Builders Stench Henchmen Stealth Strikers Bad Vibes Smash Success Two-Timers What-the-Deuce Blooper Bros.
Star Battle Arena is the solo story mode in Mario Party 8. The player chooses a character and competes against five CPU-controlled characters over five separate duels. Each of the five regular boards are played in order: DK's Treetop Temple, Goomba's Booty Boardwalk, King Boo's Haunted Hideaway, Shy Guy's Perplex Express, and Koopa's Tycoon Town. Lastly, the sixth, unlockable board, Bowser's Warped Orbit, is played for a final showdown. The general rules of of Duel Battle are used for all six duels (players take turns without regular minigames), and each duel has a different victory condition from normal Party Tent play. As the player progresses through the duels, their CPU-controlled opponents become more adept. If a duel runs over after 30 turns, Ballyhoo will end the game and declare a tie. The reward for defeating Bowser and beating Star Battle Arena mode is 200 Carnival Cards. Additionally, Bowser's Warped Orbit and the minigame Wagon (in the Fun Bazaar) will be unlocked, as well as either Blooper or Hammer Bro (if it is the player's first time completing Star Battle Arena). Replaying Star Battle Arena with Blooper or Hammer Bro (whichever was unlocked) will unlock the other character. Mario Party 8 contains six unique boards. DK's Treetop Temple Players move across this board to get a star in a random location in this board. Stars always cost 20 coins each, and whenever a player obtains the star on the board, another star warps to a different location. Landing on a DK space in this board causes DK to throw the player directly towards the star and landing on a Bowser space will cause the star to warp to a different location. To win in Star Battle Arena, the player must collect two stars before their opponent does, and the stars are 20 coins each. Goomba's Booty Boardwalk Players move through this linear board to get to the end. At the end, Captain Goomba gives the star to the player for free, as a reward for reaching this far. After receiving the star, the player will get transported back to the start via gulls carrying a wooden plank. Dolphin Expresses in the course can take the player closer to Captain Goomba by paying a fee. The fee depends on what place the player is currently in, with first place having to pay the most while fourth place the least. Landing on a DK space will give the player a chance to earn coins, while landing on the Bowser space will cause the player a chance to lose coins. To win this board in Star Battle Arena, since the player's goal is to get one star from Captain Goomba costing 50 coins, the player must have that number of coins and reach him first for the star, before their opponent does. King Boo's Haunted Hideaway Players move through a mansion to try to find King Boo and get a star from him. Out of three rooms in the house, King Boo is in one of them. If the player stumbles in other rooms where King Boo is not hiding in, Red Boos come and toss the player in a hole, thus making the player go back to the start of the mansion. King Boo offers the star for ten coins once the player reaches him. After paying for that, everyone is taken out of the mansion for another shuffle with different rooms in the mansion. If the player lands on a DK space, DK will cover up the hole and offer the player a free star; if the player lands on a Bowser space, Bowser will cover up the hole and will steal a star for the player who comes to any room. In Star Battle Arena, the winning condition required is to acquire two stars from King Boo for 10 coins each by finding him two times. Shy Guy's Perplex Express Players move through a train to get to the conductor of the train, who will offer a Star for 20 coins. The train board is linear, and therefore, there are no branching paths. After being offered for the star, the player travels on top of the train and back to the start, unlike Goomba's Booty Boardwalk where the player instantly travels back to the start. If someone lands on a DK space, DK will be in charge of the train and offers a free star to anyone who could make it to him. If Bowser is in charge instead when someone lands on a Bowser Space, Bowser will make the player lose a star to who ever reaches him. In Star Battle Arena, in order to win the game, since there is only one star and is worth 50 coins, the player must obtain that amount and reach Holly Koopa (not the conductor, who will give the player 10 coins instead) for the star before their opponent does. Koopa's Tycoon Town In this board, players invest money in hotels in order to earn stars. Investing in an amount of coins in the hotel will cause the hotel to buildup and make the amount of stars the hotel can offer to increase by one. The maximum amount of stars a hotel can carry is three. When a player lands on a Donkey Kong space, Donkey Kong will come and help invest coins. Adversely, when a player lands on a Bowser space, Bowser will take coins away from a selected hotel. In Star Battle Arena, the player has to get four stars by investing in hotels in order to win. Bowser's Warped Orbit There are no stars in this board, and so players are given five stars on Battle Royale (in a team on Tag Battle they are given ten stars). Players must use the Bullet Candy and Bowser Candy (which are exclusive to this board) to steal stars from opponents. The board is also linear; no branching paths exist (if one does not count the random branching paths in some parts of the board that the player cannot choose to take). In Star Battle Arena, the player and their opponent start off with three stars. The winning condition is to reduce their opponent's stars to zero stars by eating candy to steal stars from them. This board is unlocked by completing the entire Star Battle. Blue Space Players who land on this space get three coins. The space shape varies by board; sometimes, it's a quadrilateral shape and sometimes, it's the classic circular shape. Unlike the preceding games, there is no bonus on the last five turns that can increase the number of coins a blue space gives. Just like the preceding games, they are the most common space to be encountered. Red Space Players who land on this space lose three coins. The space shape varies by board; sometimes, it's a quadrilateral shape and sometimes, it's the classic circular shape. Unlike the preceding games, there is no bonus on the last five turns that can increase the number of coins a red space takes. They are uncommon, but it is usually more common than other spaces on the board. A bonus star can be earned if the player lands on the most red spaces. Green Space If a player lands on this space, this space triggers an event. The event varies by board and location, and it sometimes helps or hinders a player. They are the third most common space on the board. Landing on a Green Space also contributes to earning the bonus star, the Green Star, at the end of the match. Bowser Space If a player lands on this space, Bowser will show up and cause a negative effect. In some instances, however, when the player does not have any stars or coins, Bowser gives the player 10 coins instead. Bowser spaces only appear if another player previously landed on a DK space. This is also noteworthy that Bowser only does one event and will not make the players play a Bowser Minigame, unlike the previous Mario Party games. After the event has occurred, it will turn into a Donkey Kong space. DK Space If a player lands on this space, Donkey Kong will appear and will cause a positive effect. The actions he does varies by board. Donkey Kong spaces will always be available at the start of every party, but after the event has occurred, it will turn into a Bowser Space. Lucky Space If a player lands on this space, something will take the player to a lucky area. In this area, the spaces are all blue spaces; and each Blue Space has three coins. In the end of the lucky area, a free star will always be there for the player (the only exception is Bowser's Warped Orbit, which does not lead to a free star but to collect three free pieces of candy which turn out to be Bullet Candy and Bowser Candy by passing the Candy Spaces in between the Blue Spaces). The lucky area varies by board. Uniquely, sparkling particles rise up from the space. VS Space Only appearing in Star Battle Arena, the space starts a Duel Game to whoever lands on the space. Just like Duel Minigames from the previous Mario Party games, the loser of the minigame gives coins to the winner. Challenge Space Only appearing in Star Battle Arena, the space starts a Challenge Minigame. The player can earn coins if they win the minigame; but lose the entire coins bet if they lose the minigame. This is the only way a player can obtain the Challenge Minigames. Much like Orbs/Capsules, there are single-use power-up items in Mario Party 8, referred to as Candy. Players can purchase Candy from a Candy Shop for coins or collect it freely from random Candy spaces on the board. Each board provides a different, partial subset of the 14 candy types (in the Candy Shops and on the board itself). Candy may only be used before a player's dice roll. It cannot be placed on the board, unlike in previous Mario Party titles. Players can hold a maximum of three Candy items. These Candy items involve changes related to the Dice Block. Twice Candy When used, the Twice Candy adds a dice block to the player's roll. The only advantage it has over the Thrice Candy is that it is cheaper and more common. Adding a second dice block to the roll can help the player reach the star closer or other techniques used to help the player. It is very much like the Mushroom Orb and other similar items from the previous games or the Double Dice Set from Mario Party DS. Also, if the player rolls the same number on both Dice Blocks, they get 10 coins (or 30 coins for two "7's"). Thrice Candy When used, the Thrice Candy adds a second and a third dice block to the player's roll. Even though the player can travel farther if rolled correctly than a player who used the Twice Candy, the candy is a tad more expensive and rarer than the Twice Candy. It does have similar benefits to the Twice Candy, though. It can be compared to the Super 'Shroom Orbs from the previous games or the Triple Dice Set from Mario Party DS. If the player rolls the same number on all three Dice Blocks, they get 30 coins (or 100 coins for three "7's"). Slowgo Candy When used, the Slowgo Candy slows down the dice block roll, very much like the Sluggish 'Shroom Orb, but it limits the dice block roll to 1-5 instead of 1-10 (similarly to the Cursed Mushroom and Halfway Dice Block). The Slowgo Candy can be used for landing on specific spaces that the player wants to land on. It costs slightly more than a Twice Candy, but less than a Thrice Candy. These Candy items transform the player for a very brief time, allowing them to perform a specific action. Springo Candy If the player uses it, they will transform into a spring-version of the character. The player can warp to another player's space via the dart wheel and move after they made it to their destination. If used in a Tag Battle, the player can only warp to one of the opposed team players instead, and can't warp to their team player. Cashzap Candy If the player uses it, they will transform into an electric version of the character. The player can destroy half the coins an opponent has, chosen by the dart wheel. If used in Team Battles, the player will just zap a random member of the other team's coins. Note that this just removes half of the player's coins and the player who used the candy will not earn any coins. Vampire Candy If the player uses it, they will transform into a vampire version of the character. They can take coins from other players chosen by the Dart Wheel. Unlike the Cashzap Candy, the player will actually take coins from the other players. The amount of coins taken ranges from 1, 5, and 10 (5, 10, and 20 in Star Battle Arena). After the player takes the coins from their opponent, the coins that they stole from their opponents get deposited into their bank. These Candy items cause players to transform for the duration of their dice roll. Once the player's turn has finished, they will transform back. Bitsize Candy If the player uses it, they will transform into an 8-bit version of the character. Upon moving, the player will collect 3 coins from hitting a Coin Block every time they take a space. Since the player moves 1-10 spaces, they can earn up to 30 coins and a minimum of 3 per roll. This rare candy cannot be found in shops; they can only be found by moving through Candy Areas. Bloway Candy If the player uses it, they will transform into a tornado version of the character. The player can warp any opponent they pass back to the start of the board. It can be useful for places such as Goomba's Booty Boardwalk. Weeglee Candy If the player uses it, they will transform into three tiny clones of themselves and steal any candy an opponent has by just moving past an opponent. If the opponent happens to have no candy, nothing will happen. Bowlo Candy If the player uses it, they will transform into a ball version of the character. The player can steal ten coins (20 coins in Duel Battle) from any player they pass. Note that any player in a Bowlo form will pass by shops, but not stars unlike items from previous games that can make the player pass by stars as well as shops. Thwomp Candy If the player uses it, they will transform into a stone version of the character's head. The player can make any player they run into lose half of their coins. Note that this does not steal half of the player's coins; it just makes them lose half of the coins they owned. This candy also makes the player pass by shops, like the Bowlo Candy. Bullet Candy If the player uses it, they will transform into a Bullet Bill version of the character. The player can roll three dice blocks, but it can only steal one star from another player if they pass a player while in that form. The candy is only hidden in the board Bowser's Warped Orbit, where it is mandatory to steal someone's stars to win. Bowser Candy If the player uses it, they will transform into a Bowser version of the character. The player can only roll two dice blocks, unlike the Bullet Candy, but it can steal two stars from another player if they pass a player while in that form. The candy is only hidden in the board Bowser's Warped Orbit, where it is mandatory to steal someone's stars to win. Duelo Candy If the player uses it, they will transform into a fiery version of the character. The player can roll two dice blocks and if they pass an opponent, they will start a duel minigame with that opponent. The loser of the minigame gives coins or stars to the winner. Duelo Candies are also rewards from MC Ballyhoo in Chump Charity. After the player completed the minigame, they will land on the same space as the other player, instead of continuing their dice moves. In the Minigame Tent, players can play all of the minigames they have unlocked in the Party Tent or Star Battle Arena. Duel and Challenge minigames can only be unlocked in the Star Battle Arena during solo play, or in the Party Tent when using a Duelo Candy. Completing minigames earns the player cards for the player to spend at the Surprise Wagon. There are a total of five ways to play the minigames, as detailed in the sections below. Free Play Arcade is a game mode where the players can freely choose any minigame to play. However, minigames will first need to be unlocked by playing in Party Tent or Star Battle Arena, or purchasing them from the Minigame Wagon at the Fun Bazaar. In this mode, Miis often appear as spectators, often replacing species like Goombas and Koopa Troopas. Crown Showdown is a game mode that involves players trying to win the most minigames. At the beginning, the player can choose between 4-player minigames and duel minigames. If the player chooses the former, they can then choose to play between 4-player minigames, 1-vs.-3 minigames, 2-vs.-2 minigames, or random. The player also can choose how many wins are required to win the showdown from 3, 5, or 7. Each time, the game randomly selects a minigame that the player has already unlocked. Whoever wins the game receives a point, and whoever reaches 3, 5, or 7 points first is the winner. "In Crown Showdown, you'll race to win a set number of minigames before competitors do it first! What type of minigames? Up to you! Or select Random and leave it to chance!" Flip-Out Frenzy is a game mode set in a small pond with an board with grey squares and a few black ones. The objective is that players must compete in minigames and color the entire board. Once a player wins a minigame, they get to pick which squares they wants to flip over to match their emblem/color. When a player picks a square, the horizontal and vertical rows of the square next to it get colored as well. After all the squares are colored, MC Ballyhoo flips two black squares, turning them into normal squares. Once those ones are colored, two more a flipped again. When the board is fully colored, including the flipped black squares, the player with the most squares of their emblem/color wins. Players can color over other players' colored squares as well, but cannot flip squares if one of the horizontal or vertical rows have a black square. "To win Flip-Out Frenzy, you must own the most tiles by game's end. Each time you win a minigame, you'll pick a tile. It and tiles in all four directions will flip to show your mark. There's a late-game shake-up, too!" Tic-Tac Drop is a game mode similar to tic-tac-toe, except it is played with minigames, and the balls that are put into the board drop into place, rather than staying in the middle or top rows. The game begins with MC Ballyhoo initiating a random duel minigame, after which the contestants compete to win the minigame. The winner of the minigame gets to drop a ball into the board in the location of their choice. Additional minigames will continue to be played until a winner is eventually declared. The first player to form a horizontal, vertical or diagonal row with their respective colored balls wins the game. "To win Tic-Tac Drop, you must make a line up, down, or diagonally by dropping balls through the board's slots. You'll get one ball for each minigame win. If you reach a stalemate, you can start a fresh game." In Test for the Best, the player competes for the best score from playing ten minigames. The player has to unlock certain minigames to play this and they must buy in from the Surprise Wagon at the Fun Bazaar before playing it. It is similar to the Minigame Decathlon from previous Mario Party games, except only one player can play at a time. The Extras Zone is a tent where players can play one of eight minigames with either Mario characters or Miis that they've created on the Wii's Mii Channel or by using the default guest Miis. Initially, only four of eight minigames are available. The other four need to be purchased in the Fun Bazaar in order to unlock them. Up to four players can play in this mode, but some minigames only allows up to two players to play. One will only allow a single player. The Fun Bazaar is a place where the player can exchange cards for items, modes, and minigames or check records. Records Board: The player can view minigame sets or the best records here. The player can also view the Staff Records after they bought them from the Surprise Wagon. Minigame Wagon: Minigames can be bought here using Carnival Cards. The wagon is only accessible after completing the Star Battle Arena. Carnival Wagon: The player can view any Carnival Figures they collected and watch them in a Carnival Parade. Surprise Wagon: The player can trade Carnival Cards for various items such as Sound Tests, Extra Minigames, Carnival Figurines, and other stuff. Unlike what the instruction booklet says, it's always available. Carnival Calliope: The player can listen to music, sounds, and voices by accessing here. Some features must be bought at the Surprise Wagon first before listening to it. Mario Party 8 has a total of seventy-three minigames, most which make use of the Wii Remote and its motion control capabilities, though some also require the controller to be held in a more traditional way. 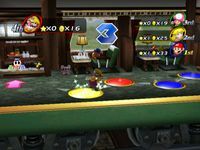 Unlike other Mario Party games, all minigames rather than a randomized select few are displayed in a single, large roulette corresponding to what type of minigame they are. For this subject's image gallery, see Gallery:Mario Party 8. As with most Mario Party games, reviews have been mixed. One of the biggest criticisms was the lack of wi-fi and widescreen. Matt Casamassina of IGN referred to the single-player mode as "torture" and commented on the visuals as "graphics don't even impress as a GCN title". Nintendo Wii Ryan Davis, GameStop 6.5/10 Mario Party had been the only persistent minigame franchise for years, and Hudson got a little too comfortable because of it. The fact that there are more interesting minigame collections out there now, like Rayman Raving Rabbids, puts that laziness in stark relief and makes it more difficult to tolerate. If you've got the patience to dig past the skill-free board game portions of Mario Party 8, there are some genuinely inventive minigames to be played. The point, though, is that you shouldn't have to dig at all. Nintendo Wii Gerald Villoria, Gamespy 3/5 While unimpressive from a technical standpoint, and uninspired from a mini-games standpoint, the core Mario Party formula remains intact. As with any multiplayer oriented game, having a good time is always possible as long as you surround yourself with good friends. So yes, this eighth installment of the series may be worth your while if you like throwing Wii parties and have exhausted all of the Wii's better such games already. Otherwise, you're not missing much. Nintendo Wii Mathew Kumar, Eurogamer 4/10 Mario Party 8 is a "would have, should have, could have" kind of game. With such an depressingly long list of wasted possibilities, and so many other mini-game collections available for Nintendo Wii (The excellent Rayman Raving Rabbids, for one) It would be wrong of me to say you should pick this up. Fun could be had here, but even with the most forgiving group of friends, it's going to be short-lived. After its North American release on May 29, 2007, the game sold 314,000 units in the United States in three days, making it the best-selling home console game in the country that month. As of March 31, 2008, the game has sold 4.86 million copies worldwide. In Japan, Mario Party 8 has sold 1,239,716 copies as of the end of Q2 2008, according to Famitsu. Mario Party 8 is the 11th best-selling game for the Wii, selling 7.6 million copies worldwide, as of March 31, 2014. The launch of Mario Party 8 in the United Kingdom had several difficulties. Originally scheduled for release on June 22, 2007, Nintendo announced on June 19, 2007 that the UK version of the game had been delayed to July 13 of that year due to a production issue. "[Mario Party 8] was launched in the UK today. Unfortunately we have discovered that a small number of games contain the wrong version of the disk due to an assembly error. We have therefore decided to recall all copies of the game from UK retailers so that this mistake can be corrected. We will re-launch Mario Party 8 in the UK as soon as possible and will announce a new launch date shortly. We very much regret any inconvenience caused." "Magikoopa magic! Turn the train spastic! Make this ticket tragic!" Due to "spastic" having a highly negative connotation in the United Kingdom, the game was declared banned and immediately recalled. Mario Party 8 was eventually re-released in the United Kingdom on August 3, 2007, with the offensive statement altered; copies without the word "spastic" use the word "erratic" instead. Although it is unknown if Mario Party 8 is the direct catalyst, several first-party Nintendo games released after it have had at least a few English localization differences between the American and PAL releases, rather than the American English text being used for all regions. A similar offense in Super Paper Mario with the word "shag" was preemptively altered for the PAL release. Super Mario Bros.: Sprites of Mario and Bowser appear in Bowser's Warped Orbit and sprites of Mario appear at the Star Battle Arena, printed on the toybox of Mosh-Pit Playroom and on the wrapper of Bitsize Candy. Super Mario World: The Koopa Clown Car returns. Super Mario Sunshine: Piantas appear in Goomba's Booty Boardwalk, with their voice clips being recycled from this game. Mario Kart: Double Dash!! : The dinosaur from Dino Dino Jungle appears in DK's Treetop Temple. When a player lands on a Bowser Space in Shy Guy's Perplex Express, the Bowser face on the front of the train resembles the face on the front of the Koopa King, Bowser's signature kart. Mario Power Tennis: Boo's voice clips are recycled from this game. Super Mario Strikers: Hammer Bro's voice clips are recycled from this game. Mario Party DS: The playable characters' profile models and voice clips are reused in this game. Mario Party 9: All the playable characters (except Toadette) reappear, with Boo, Dry Bones, Hammer Bro and Blooper becoming supporting characters. Also, some of the characters' voice clips are reused. Super Mario Run: Princess Peach and Bowser's artwork are reused. Mario Party: The Top 100: Three minigames return in this game. A cover version of the minigame completion theme plays when completing any of the three Mario Party 8 minigames. MC Ballyhoo and Big Top make a cameo in the Characters section of the Series Guide. without Koopa Kid (known as Mini-Bowser in PAL regions) or Bowser Jr.
where the players' stats while playing in a board is not in the four corners of the screen; it is shown in a column in the top right corner. to show all minigames from a selected category on the roulette wheel, instead of only three, four, five, or six. in which the design of the spaces varies from board to board to fit their surrounding aesthetics better. This is the first Mario Party game that does not have the minigames rules hosted by the host of the board/game, instead put as a separate section in the minigame rules screen. From Mario Party to Mario Party 7, the minigames were all hosted by the hosts of the board and/or the game. The NTSC and PAL versions use different fonts for text; the font used for the main text in the PAL version is the same as the font used from Mario Party 4 to Mario Party 7. This page was last edited on April 20, 2019, at 08:31.